You can't break it down with "Break It Up". It's not funny when an artist or band pulls a 180° and tries their luck on a genre that they don't have too much experience producing. No, it's not just funny, it's DAMN funny. Neil Young did it a long time ago with his weird electronica material, Lionel Richie started doing upbeat dance music in the early 2000s, and let's not even ask what that Kid Rock guy is up to nowadays. But back in 1996, those three wacky German fellows from Scooter (H.P. Baxxter, Rick J. Jordan, and Ferris Bueller) were doing the same thing. On their third album, "Wicked! ", they decided to take a crack at something different: slow, ballad-style music. 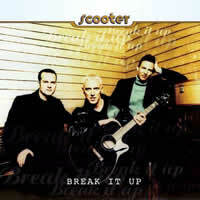 In fact, it has been proclaimed that Scooter was the first electronic music band to create a "techno-ballad". And so, as the second and final single from that album, "Break It Up" was an interesting experiment that could either be seen as a brilliant success or something just plain laughable. The choice is really up to you. As for me, I would declare that "Break It Up" was not a futile effort. The song, which ends up being far more ballad-related than anything close to electronic music, features some fine symphonic pads and an acoustic guitar part that is actually rather soothing. And you can question H.P. 's singing voice all you like -- we know that he certainly has difficulty in that department presently -- but it's not something that is brutal to the ears. I guess the song is about breaking up with a loved one, as you can tell by these fine chorus lyrics: "Break it up, break it up, break it up, my love... If you think that you can stay with me, break it up, my love..." Okay, maybe they're not superb. But what's amusing is that the lyrics (and even perhaps some of the instrumental parts) were not penned by Scooter; indeed, a professional writer, Nosie Katzmann, who is known for producing and composing alongside many famous dance acts, such as Culture Beat, Jam & Spoon, Captain Hollywood Project, and even Cascada apparently. (So you KNOW he's worked with top-notch artists.) So this isn't really as much a foray into new territory as it is a collaboration. Hmmm. Anyway, the Radio Edit is pretty straightforward poppy ballad stuff, so if you're into that type of tune, this would be a good place to look. We are also lucky enough to get the Unplugged version of the song as well, which is even more laidback, and features a wider variety of real instruments being played, including another guitar and some nice piano work. H.P. 's vocals and the background music sound a bit more like one of those live recordings, but I still think that they're the same ones as in the Radio Edit. This is the least electronic Scooter will probably ever sound like, but it's nice to see a softer and deeper side of the group than I'm used to. But the real treat for me, the goofy trancehead, is the B-side, Wednesday (Kontor Mix). I suppose someone at their parent record label (Kontor Records) remixed this or something, although there doesn't seem to be any original mix around. This is a far more upbeat and dancy tune, featuring some amusing string synths and rockin' beats. But the real fun begins right after H.P. sneaks in a "Ha-Haaaaa!" and we get an amazingly cheery piano rhythm going; combined with the bassline, we have ourselves a super party track! Unfortunately, that part doesn't last too long before a relatively somber but still partially groovy second half of the track sets in. Frankly, I tend to stop listening after the piano part ends because there's nothing special after that. As a whole, I found "Break It Up" to be an intriguing single that shows the musical flexibility of Scooter (plus there's a chipper B-side to round out the package). Sadly, future attempts at ballad structure generally end up annoying me more than entertaining me, so this is probably the best you'll find. (The track "Leave In Silence" on their follow-up album is a testament to that.) If you are a fan of ballads, or just of Scooter music in general, and you can somehow scrounge this up (I know you can snag it on iTunes), you'll find some great enjoyment in it. For all others, this may not be for you.